A lot lies in a name, and Shakespeare knew it. Writers know it, too. In our house we laugh at the name of the little boy in “The Walking Dead.” My close friend will wince when I say that Carl is not a common name for a little boy. But in TWD, Carl is not the usual little boy and the problems that confront him are far from a carefree childhood he should be experiencing. In a way Carl fits, because the little boy goes from boy to man quickly. And my name–Lyla–is not a child’s name either, though friends tell me it is becoming popular. I have never met another Lyla face to face. As I was growing up, I was told that my name didn’t “fit” me. I’m named after my father Lyle and so I take pride in my name, but I won’t lie, it has been a bit of a burden. When people heard that a “Lyla Fox” had been tired to teach high school English, they later revealed they thought I was a fifty-some year old woman,not the twenty-four-year-old woman that I was. I have finally grown old enough for my name, but my characters and those of others don’t have the luxury of decades for their readers to get used to their names. Harper Lee gave us two spot-on names when her little girl and boy were nicknamed Scout and Jem. Their real names are Jean Louise and Jeremy Finch, but the names we who love Lee’s magnificent and powerful novel are attached to are Jem and Scout. For me it wouldn’t have been the same if she’d given Scout another Southern nickname like Sissy or if she’d named Jem something like the more common Beau. The names like her own Harper (rather than her first name Nell) fit. She gave us characters for time immemorial in a story that in many ways still defines the struggles of a nation. Know this lady? You can probably guess by the book she’s reading that she’s the author of one of our all-time favorites Gone With the Wind. She also gave an infinitely popular literary figure what I think is the perfect name: Scarlett. Think about all that the name connotes. Blood? It’s the Civil War and bodies and blood abound. Scarlett, as in “Scarlet woman,” that she is, again and again in the novel. There are so many words that connect perfectly to the beautiful but flawed character around whom Mitchell built her opus. At a picnic over the forth, a friend collared me to talk about my own books. She wanted to know about the characters’ names in Snoop and Murder on Cinnamon Street. 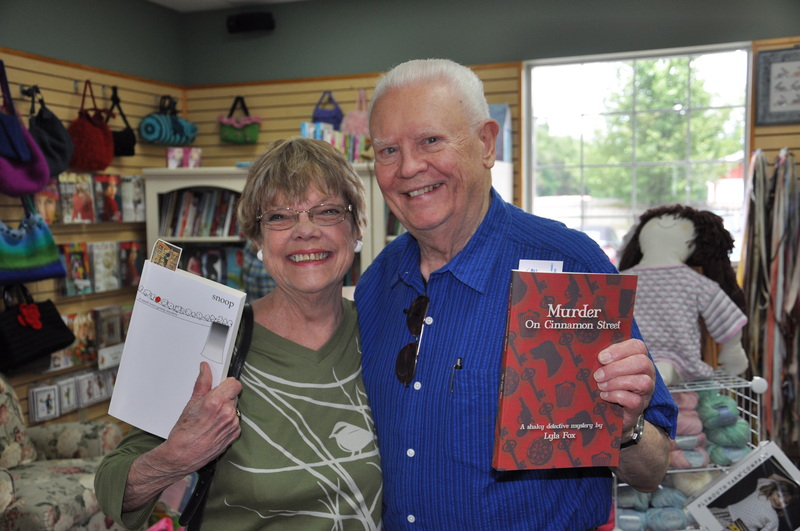 (My thanks to friends Jim and Joyce for their cheery promo of my books.) In truth, I gave great thought to all the names because, as I’ve mentioned earlier, my own name has been at times unwieldy. I want the characters I create to be happy with the names I choose for them so they don’t one day come back on me. Let’s deal with the characters in Snoop to illustrate how I named a couple of the characters in my cozy mystery. In Snoop, my protagonist has the name Sam. She’s a girl with a man’s name. It’s problematic, but I have a reason. Her mother’s maiden name was Samuels, and her mother was a virtual orphan whose family name means something to her. Sam’s father’s favorite fictional character is Sam Spade, thus the nickname. With this name I have linked character, plot, and genre. I hope. One of Sam’s touchstones is a woman named Aggie Chestnut She’s seventy something and irascible. Aggie is a tipping of the hat to Agatha Christie and Chestnut is a name I first heard when I was in college and was fascinated that it would be anybody’s last name. I loved it and tucked it away to retrieve decades later. My town is Cotter’s Corner because the book’s to-die-for, literally, love interest is Charlie Cotter, heir to the Cotter fortune. He tells Sam that one of his Cotter ancestors was traveling around the Midwest when he came to a beautiful, picturesque area. As the story goes, he sat down on it. Looking around he said, “This is going to be my corner of the world.” The town was named Cotter’s Corner. It is a place that has become real to me and one I’m going to resurrect for the sequel I’m at work on now. The woman in this picture has my great name, the name I always go to for the most unusual name: Hermione. 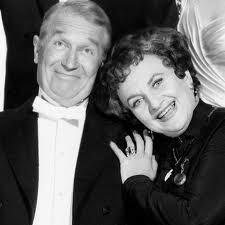 Long before JK Rowling came up with her one-of-a-kind muggle, Hermione Gingold was delighting audiences on stage and screen. From her name to her style, she is inimitable and unforgettable. That’s what I aim for: characters that become etched in my readers’ minds and stay with them long after my little cozy has been read and shelved. That will leave them wanting more, and give me a chance to do what I love so much–return to places like Cotter’s Corner and visit with the odd assortment of characters who live–and die–there. This entry was posted in Cozy Cat Press and tagged character names, Lyla Fox, mystery, quirky, Scarlett O'Hara, Scout, Snoop, writing by Lyla Fox. Bookmark the permalink.